Mission accomplished, one of the reasons for this trip was to try and get a photograph of this elusive bird. I saw them yesterday on Coll, and as I travelled across Tiree I had heard them. Here I had stopped cycling again and was stood listening to several calling birds in a field to my right. As I crept down the lane, trying to get closer to the birds, and to try and locate exactly where they were calling from, it was made more difficult by the fact that as they call, they sometimes move their heads and it changes where the sound appears to come from. However I was sure I very close to at least one bird, and was scanning the vegetation for a glimpse of one. As I was doing this, I became aware of another bird calling to my left, very loudly. He had to be close. Very close. He was calling often, but I couldn't see him. Then I spotted him. You might think from the photograph that he was easy to see. Believe me, they are amazingly well camouflaged and though he was popped up on the rock still very difficult to see. This rock was just on the edge of somebodies garden and he happened to come out of an outbuilding as I was taking these shots and came over to talk. They are regular summer visitors to his garden and he told me a few stories about them. Earlier this year there was a big commotion when there were three males and two females, which were all involved in a courtship dispute. 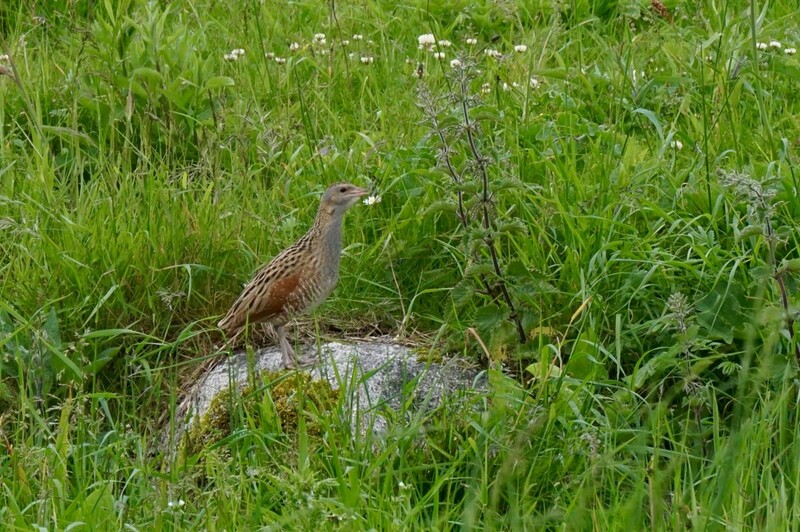 Last summer he had young baby Corncrakes come walking in through his patio doors and he'd had to shoo them all out.